Traditional web inspection has been cost prohibitive for many brown board machines due to the requirement of using dedicated camera and light beams to eliminate the optical ‘noise’ in the environment. Line scan based inspection systems require the camera to be placed perpendicular to the sheet which restricts camera placement options. This white paper explains an alternative software and hardware solution from ECS that uses area scan cameras placed outside the sheet using 100% existing mill lighting to provide critical process data to increase the paper machine’s OEE. This may be the final inspection solution for some machines while others will require dedicated LED and camera beams that ECS also manufactures. Traditional WIS systems typically isolate the camera from optical ‘noise’ by using highly engineered cross directional beams with dedicated lighting systems. Many web inspection systems also use line scan cameras that require the camera to be perpendicular to the sheet and must have an encoder signal to ‘reconstruct’ the image from the single ‘line slices’ of the sheet. And in the case of dust – both area scan and line scan cameras may consider dust as defects as the dust creates concentrated round shadows on the sheet when using reflective lighting sources. OEE stands for Overall Equipment Effectiveness. It has three main criteria: 1 – Uptime, 2 - performance (process speed) and 3 - product quality. Correctly operating web inspection systems can positively influence all three aspects of OEE. But the data resulting from WIS must be free of false triggers and not miss defect for the data to have value. The cost of this solution should not restrict it to only the more expensive paper grades. All of these factors can contribute to expensive and complex solutions to deploy web inspection. Or poorly performing systems that may generate large amounts of data with only a portion of that data as being useful to make critical machine running decisions. A large portion of brown board machines use cameras only for event capture. While event capture is an extremely valuable tool – it’s a reactive tool and requires the combination of an operator and video to determine a course of corrective action. Web inspection systems that are properly designed and installed can proactively provide an entirely new set of data to decrease machine downtime and increase paper quality. The ECS solution is fundamentally different in its approach to web inspection. Instead of eliminating the noise before it is captured by the cameras – ECS uses what is called Real-time Dynamic Threshold Template Imaging to remove the noise by software – not in the environment. Every frame (and corresponding pixel of the frame) that is captured by the ECS program is compared to a new and unique template image. One or more cameras mounted outside of the sheet with ambient mill lighting and no encoder can capture, classify and display critical process data. This includes edge cracks that will break the sheet at winder, slime spots, holes, water drops, etc. This means actionable process control data can be collected in noisy environments without costly beams and dedicated lighting systems. ECS does use beam structures for cameras and LED’s in many grades of paper that require finer defect detection and precise classification. The emphasis of this paper is to address the considerable number of machines that still need a more value based automated defect detection to proactively alarm and reduce unwanted defects, costly downtime and customer quality complaints. The five illustrations below show the difference between static and dynamic threshold applications. Even if the software resets the template every couple of minutes or some other time interval – the system is still considered static. Since going online, Major Tissue Manufacturer’s new ECS-enhanced system has re-established interest from operators as an OEE improvement tool, and enabled dramatic improvements to the facility’s efficiency. 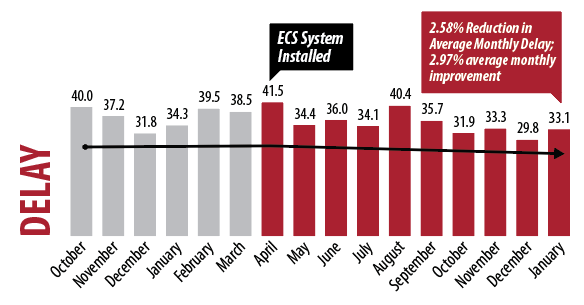 The average rate of PSOEE (Product System Overall Equipment Efficiency) improvement in the 6 months prior to the upgrade was only 0.29% month-over-month. In the 9 months since the upgrade was completed, average PSOEE is over 4% higher, with a PSOEE improvement rate jumping to 3.83% month over month. Efficiency gains have also been measured in regards to Speed, Waste, and Delay. Major Tissue Manufacturer’s Facility had camera systems installed on their Bath-1 and Bath-2 converting lines since inception, but the system went largely unused by operators due to the software being difficult to use and out of date. With much of the original camera system hardware still functioning, they sought an upgrade that integrated new functionality and ease of use with the existing installation instead of investing in a costly new system with a lengthy install. To get the best possible performance out of the facility’s existing cameras, 51” constant-on strip LED modules were installed strategically to optimize capture without creating problematic shadows or interfere with operator access to machinery. The cameras were encased in ECS timed air-cleaning enclosures to keep equipment safe and operator interaction minimal. Installing a 23” touchscreen panel-mount monitor allowed operators to interface with cameras intuitively and quickly to target crucial data, even when wearing gloves. In addition to cameras, the system utilized the previous installation's cabinet and backbone to keep costs low. To prevent the system from falling out of use like the previous one, ECS provided hands-on training to give operators solid working knowledge of the system and lower the barrier of comfort related to use. The software was configured with a simple user interface to ensure regular operator utilization. All critical ECS functions can be done by Touchscreens actions. A system that is easy to navigate will get used more by operators. This means more problem-solving and increased machine efficiency. The upgraded system was configured using the existing rack and backbone of the previous installation. Closeup of the custom ECS camera enclosure with timed air cleaning functionality. ECS was awarded the contract to supply a 22 camera system on the PM 8 board machine. Both event capture and integrated web inspection are included. This solution will combine several technologies developed by ECS to provide outstanding resolution on this large 340” wide machine. One of the bigger challenges for web monitoring camera systems on brown board is delivering high value resolution across the entire sheet in hostile wetend environments. ECS will be using a new generation of LED technology that generates hundreds of thousands of lumens of light to each monitoring position. This amount of light energy allows the camera to operate at optimum settings to deliver high contrast, high depth of field and high stop action clarity. The better the operators can see sheet conditions and process disruptions – the better the ability to understand reasons for downtime or pinpoint problems before sheet breaks occur. Web inspection at the reel with roll map reporting and defect alarming compliment the upstream event capture cameras so issues that might pass to the winder can be identified, tracked and eliminated. Future expansions for this installation and others that are similar include installing the ECS IMDR (Inspect, Mark, Database and Read) Technology that tracks defect and process data from the parent machine through all value add processes. ECS has sold a two camera high speed Event Capture System to Tesla Motors. The configuration is our Teyetan series that utilizes a self-contained MRU (Modular Recording Unit) to process the camera and playback functions. The mobile MRU has a quick release attachment to a mobile cart that allows the MRU to be removed from the cart and used inside manufacturing processes. Any laptop can be used to review and control the system with the built in MRU wireless access point. The ECS touch screen interface on the mobile cart creates a user interface operators can immediately understand as control functions are similar to any common mobile device. The software also incorporates a seamless interaction between live video and review (called the LSP module – Live, Stop, Play). The ability to instantly shift between live video, synchronized review video and scrub extended video buffer is a critical operator feature. The ease of use, ability to capture high resolution/high frame rate video and flexibility of how the unit is deployed makes the Teyetan family of solutions an easy choice as a tool to increase manufacturing process OEE.